Our Custom Wall Decal Quote is “your personal quote” wall decal – choose from 6 fonts and 18 colours. Free gifts and free delivery across South Africa! Type the quote exactly as you want it plus add the name of the writer below. 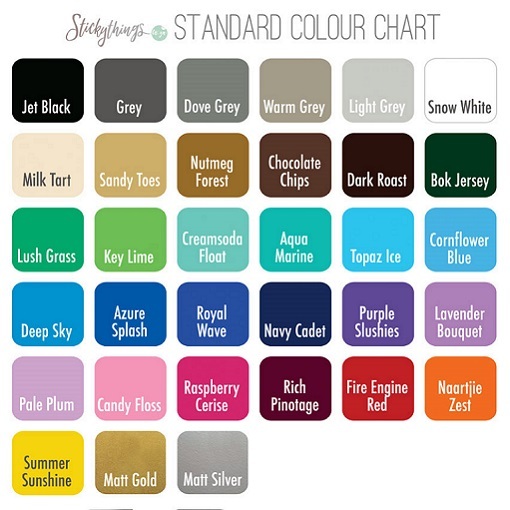 Custom Wall Decal Quote colours: Jet Black, Grey, Dove Grey, Warm Grey, Light Grey, Snow White, Milk Tart, Sandy Toes, Nutmeg Forest, Choc Chips, Dark Roast, Bok Jersey, Lush Grass, Key Lime, Creamsoda Float, Aqua Marine, Topaz Ice, Cornflower Blue, Deep Sky, Azure Splash, Royal Wave, Navy Cadet, Purple Slushies, Lavender Bouquet, Pale Plum, Candy Floss, Raspberry Cerise, Rich Pinotage, Fire Engine Red, Naartjie Zest, Summer Sunshine, Matt Gold, Matt Silver or Mirror Metallic Rose Gold. The main photo of our Personalised Quote is in Choc Chips. Modern, Roman, Typewriter, Curly Sue, Monkey Font or Playground. Click here for more on our Fonts. The reason why there are only 6 fonts to choose from is because the letters become too thin with the other 4 fonts and becomes more difficult to install. We are all about easy! It depends on the exact quote, but we try to fill the entire sheet of 1m x 57cm (h). The maximum dimensions of your quote will be at least 99cm wide or 56cm high. This custom quote works best with 8 – 15 words (it does depends on your font and exact words) but be aware that the more words, the bigger each word will be and visa-versa: the more words, the smaller each word. If you do have lots of words, rather choose a “chunkier” font like Modern or Playground. We don’t want to limit you but we do recommend not using more than 30 words – the letters become so fine that it becomes very difficult to install. Please contact us if you have lots more words and need a larger Custom Quote Decal (2m x 57cm). – Your Custom Quote (fits on a sheet that is 1m x 57cm). – FREE: 8 Mini Butterflies for your Laptop (largest: 4cm x 3cm; smallest: 2cm x 1cm). Get your Custom Quote made into this Large Custom Wall Decal Quote. Choose from our 6 font types and 18 colours, you can really make your custom quote decal unique! “May the sky be the limit” to the quotes you can choose, or take a look our favourite inspiring quotes here – we also love these Quotes for Kids. The optimal umber of words for your custom quote is 8-15 words, but you can go up to 30 words. Any more than that, we suggest going onto a larger sheet. The more words you have, the smaller each word will be. You can also add the Writer’s Name, which will be in standard Arial Bold very small centered and underneath the quote. And: Get 8 mini butterflies for your laptop (or Ipad etc.) in the same colour scheme for free! We also have a small custom quote wall sticker.